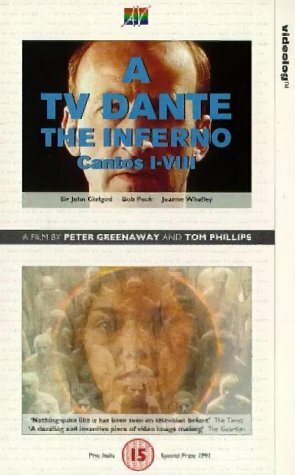 Greenaway collaborated with English painter/polymath Tom Phillips to create this visually impressive attempt to bring Dante's Inferno to the television screen. Bob Peck plays Dante, as narrator; his guide, the Roman poet Virgil, by Sir John Gielgud, and Dante's muse, Beatrice, is portrayed by Joanne Whalley. The Divine Comedy was originally written at the beginning of the fourteenth century, when its author was 35, or 'halfway through the journey of this life'. The political and national turmoil of Italy at the time forced Dante Alighieri, ambassador, diplomat and governor, to re-assess his life and embark on a spiritual journey. The three stages of this journey are the three books of the Comedy (the prefix Divine was added later): Inferno, Purgatorio and Paradiso. There is little doubt that the Inferno is the most widely known of these three; Dante's vision of a multi-layered hell, with its graphic depiction of the various grotesque punishments meted out to its inhabitants, is horrific yet compelling on both the page and the screen. Although the allegorical value of Dante's original vision may be less immediately relevant to this late twentieth century society there is a universality to the sins and the sinners that we encounter on his journey.